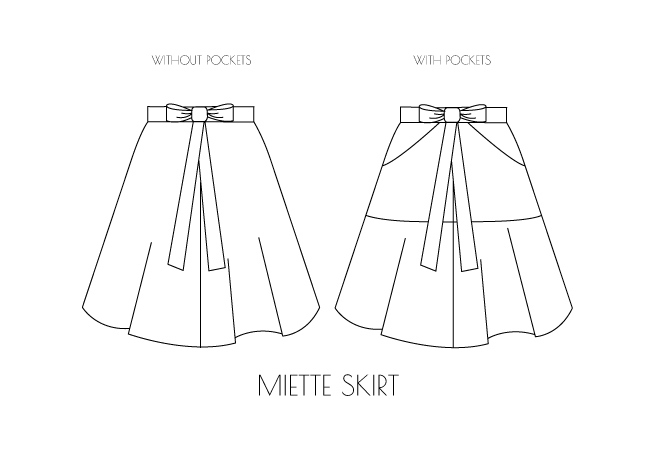 So what fabric are you going to use to make your Miette skirt? * Miette will look lovely in medium weight linen, cotton (including twill and gabardine) and denim. * Fabrics that have a bit of body or structure will give the skirt a fabulous strong shape. Just be careful not to pick anything too thick or heavy that would create bulk, as you need to be able to pass one of the waist ties through a gap in the side seams to do the skirt up. * The grainline runs parallel to the skirt side seams, meaning that any patterns or visible weave on fabric will flare out at an angle rather than fall horizontally. So if you're choosing a patterned fabric, you may want to think about how the pattern will fit together along the centre front line. Or if you don't want to think, just pick something plain or with a small print! * Topstitching in a contrast colour and fancy stitch looks fantastic. Or try hand embroidering a design on the pockets. * Make the facings of the waistband and pockets (the parts that go on the inside of the skirt) in a contrast fabric. Cut 3 of the 6 waistband pieces and 2 of the 4 pocket pieces in this fabric. * If you're confident at matching patterns, how about creating a chevron effect on the centre front seam by using striped fabric? * Sew contrast buttons on the pockets. * Add piping to the waistband seam or a trimming to the hemline. For more inspiration, check out the fantastic Miettes that are already in the Maker Gallery. 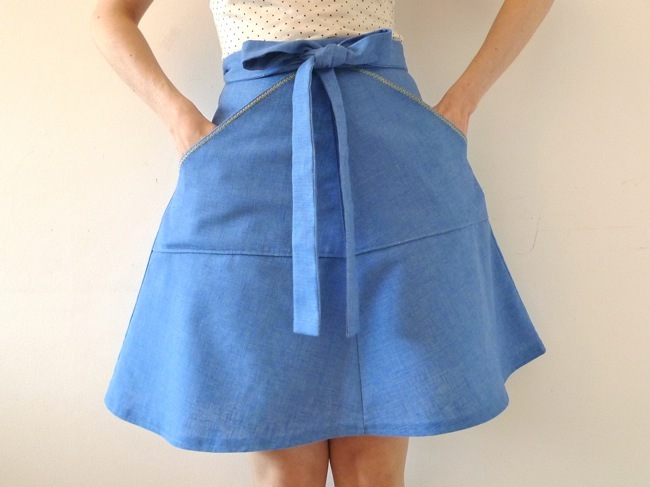 What design ideas do you have for the Miette Skirt? I can't wait to see!